One of the anticipated outcomes of the attitude emanating from President Trump’s White House concerning the Israeli-Palestinian conflict is a loosening of the reins which held back to some degree unbridled promotion of East Jerusalem building plans. In this spirit, Prime Minister Netanyahu declared yesterday (January 22) that he intends to remove the political limitations on promoting building plans in the city. During President Obama’s administration, Israel promoted building plans on a very large scale, although since failure of the Kerry peace talks (2013-2014) there has been a significant slowdown in approval of building plans and publishing tenders, together with carrying out large-scale construction in numerous areas through previously approved plans. Below is a list of building plans which have been halted for several years. In as much as Netanyahu's statement indicates a green light to advance these plans they are liable to have a destructive impact on the future possibility of establishing a Palestinian capital in Jerusalem and preservation of Palestinian territorial contiguity between Jerusalem and the West Bank. 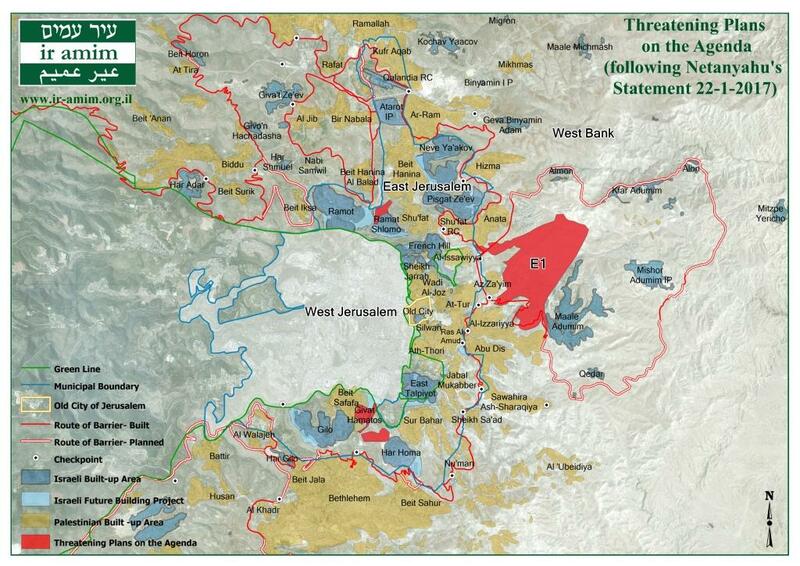 Therefore advancement of these plans will be a serious threat to reaching a two-state solution. For more details on each plan, see the enclosed document. Betty Herschman Ir Amim's Director of International Relations & Advocacy is away from the office.